The most recent signing make their WTII debut with the release of Blackout. Following the self released SOS EP, Blackout blends melodic and aggressive vocals with driving beats, heavy synths and intricate programming. 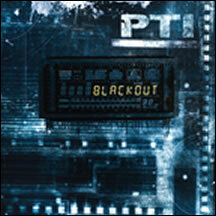 The tracks "Gone Silicon," "IDentify" and "Database" are destined to be club hits, while "Ivory Tower" and "Vacant" showcase the more melodic side of PTI. Overall this 11 track release will expose the masses to the world of PTI and leave you wanting more.